Years ago I discovered Abstract Expressionist painting and was drawn to the work of Mark Rothko and tried to emulate him for a time when I was painting. His colours shimmered for me, and drew me into spaces where I felt different, felt I could find out about colour in ways that was not usually possible. 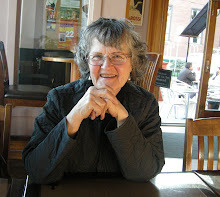 So when I had an invitation from my friend Jan Mason-Steeves (http://www.janicemasonsteevesartwork.blogspot.com/) to see “Red” in Toronto at the Bluma Appell Theatre, I had no hesitation. It was yes, yes, yes. I was not disappointed. I don’t want to give away everything about the play, but the performance was superb with Jim Mezon playing Mark Rothko and David Coomber playing the artist’s assistant named Ken. The staging and the music matched the acting in working as a whole, and I found it extremely moving. Rothko was born Marcus Rotkovitch in Latvia in 1903 and immigrated to the States with his family when he was ten years old. He was seen as gifted and received a Yale scholarship but dropped out and went to New York. There he discovered his love of art at the Art Students League. His work was well received from the time he first began showing. By the 1930s he became friends with other New York painters, among them Milton Avery, who became something of a mentor, and Max Weber from whom Rothko learned that making art could be a way of expression emotion. In Rothko’s early works, he painted urban scenes and mythological subjects, as well as portraits. He read the works of Friedrich Nietzsche and gave much thought to the emptiness of humanity. He turned from representational work to abstract colour-field painting, convinced that his paintings expressed timeless, universal emotions. 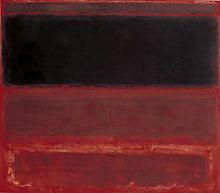 “Red” convincingly and dramatically shows Rothko as he experienced angst about his painting; his enormous effort to lay paint on the canvas in a way that was meaningful and satisfied him; and his fury with a person who could not fully enter into his work in the way the artist wanted. Rothko was not a “nice” man - he easily ranted and raged at the efforts of society to pretend everything was “fine” when everyone was full of detritus, which translated into emptiness. Central to the play was the development of the relationship between Rothko and his assistant Ken, who in the beginning was shy and frightened of this great artist. Ken won his way into Rothko’s heart in spite of being Mr. Tough Egotist. It is this personal interaction, and Ken’s risk in revealing the traumas of his life (brought to the fore by his associations with colours Rothko was using ) that wins the audience and makes the atmosphere in the theatre electric. Another key element in the play was a commission Rothko won to paint murals for the Four Seasons restaurant in the Seagram Building in New York. After having dinner there, he came away declaring it merely as a den of jackals who jawed and yawed over nothing, and he couldn’t stand the thought of his wonderful work being in that restaurant where the patrons would not care about the paintings. He cancelled the whole thing. It was wonderful to share the play with you Jane and to have the time on the way home to discuss some of the things that came up for us. Jane, your blog is similar to mine in that you too pay attention. While we pay attention to contrasting things, the act of visual and psychological vigilence is similar I particularly enjoyed the blog on the photos of older people. Your own world was made the richer because you noticed. I love Rothko and was excited that the theatre in Victoria where I hold season's tix was going to put it on. It has faded a bit in my memory now as I saw it in the fall. I was saddened by the fact that Rothko seemed to have so much contempt for his audience. Perhaps it was just an expression of his personal angst as an artist. But I did enjoy the play.